Hi friends! 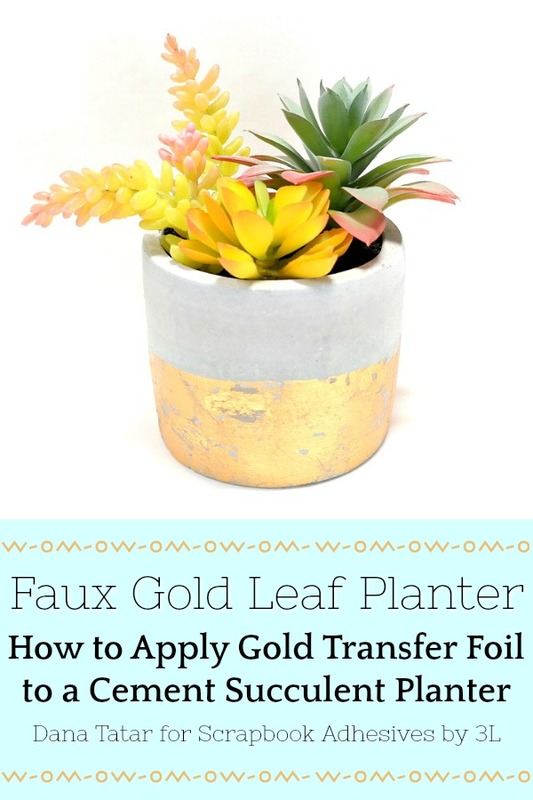 Dana Tatar here today sharing a fun home décor tutorial that features Gold Foil Transfer Sheets to create a faux gold leaf finish. To combat the dreary Winter days I added a pop of color and a touch of glam to my space. 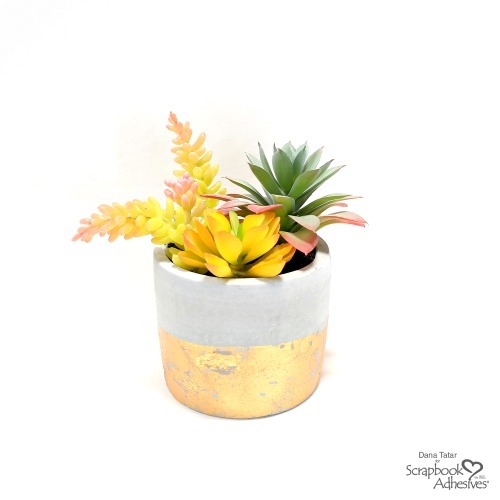 I chose a faux cement succulent planter for this project, but any container will work. I know from past experience that I can’t keep house plants alive! I’m really happy with my new statement piece! Adhesive Sheets provide a clear application of strong permanent adhesive for edge-to-edge coverage on all types of surfaces. 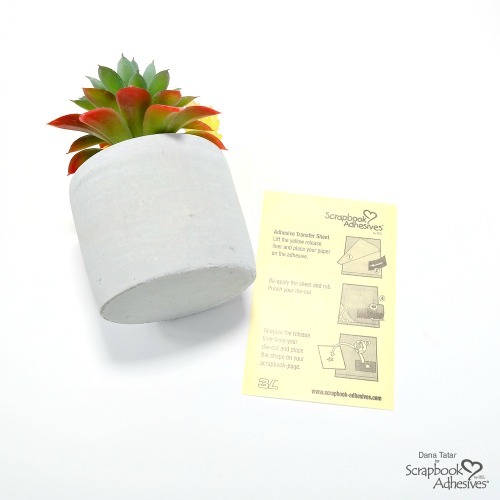 Begin by selecting the size of Adhesive Transfer Sheet that fits best with your planter size. I used the 4×6 inch sheet. Adhesive Transfer Sheets are offered in 6×12 and 12×12 inch sheets as well. 2. 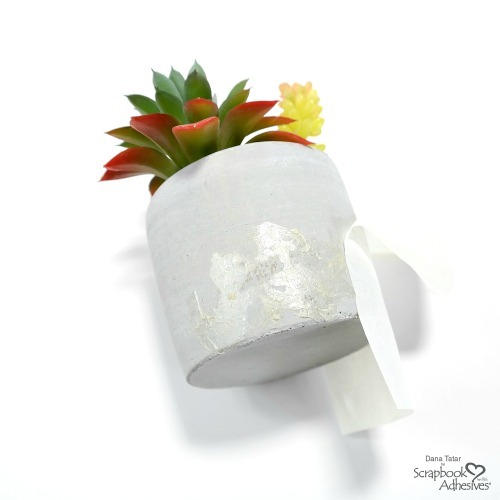 First, remove the yellow backing paper from the Adhesive Sheet and align the sheet onto the planter. Then, press firmly and rub to transfer the adhesive onto the planter. 3. 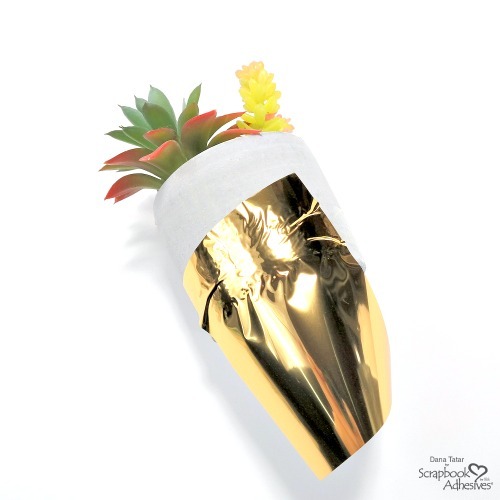 Cover the adhesive with a Gold Foil Transfer Sheet. 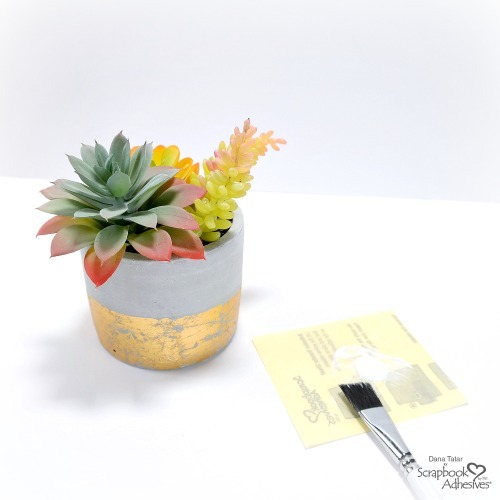 Next, rub and peel away to apply the Metallic Transfer Foil to the planter. Repeat steps 2 and 3 until the planter is covered. Gold Foil Transfer Sheets are included in both the 3D Foam Creative Embellishment Kit and the 3D Foam Holiday Embellishment Kit. 4. Once the first application of foil is complete, go back and spot apply adhesive and foil to any areas without foil. It doesn’t have to be perfect! Veining and flaked areas add to the rustic aesthetic of the faux gold leaf finish. Designer Tip: Try applying Metallic Transfer Foil from used sheets for a more random/natural finish. 5. Lastly, seal the planter with a coat of clear gesso. Thanks so much for stopping by today! I hope your New Year is off to a great start. This entry was posted in 3D Foam Shapes, 3D Projects, Adhesive Sheets, Adhesives, Altered Art, Gifts, Home Decor, Intermediate, Metallic Transfer Foil, Permanent Adhesive, Seasonal Craft Ideas, Skill Level, Tutorial, Wear your Adhesive on the Outside and tagged 3D Foam Creative Embellishment Kit with Foil, 3D Foam Holiday Embellishment Kit with Foil, Adhesive Sheets 4x6", Craft Foil, Dana Tatar, Faux Gold Leaf, Foil, Home Decor, Metallic Transfer Foil Holographic, Planter, Succulents, Tutorial, Wear Your Adhesive on the Outside. Bookmark the permalink. 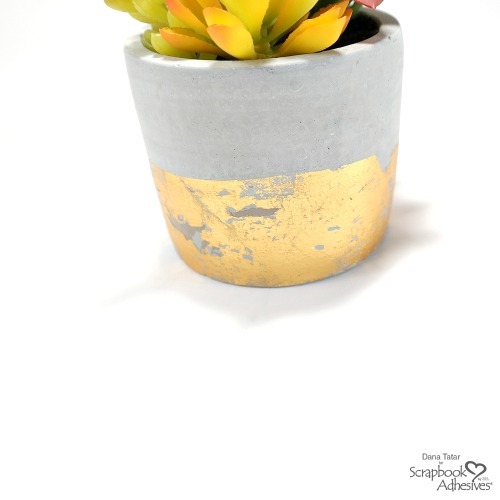 2 Responses to "DIY Faux Gold Leaf Succulent Planter"
I love how this turned out! Great project.